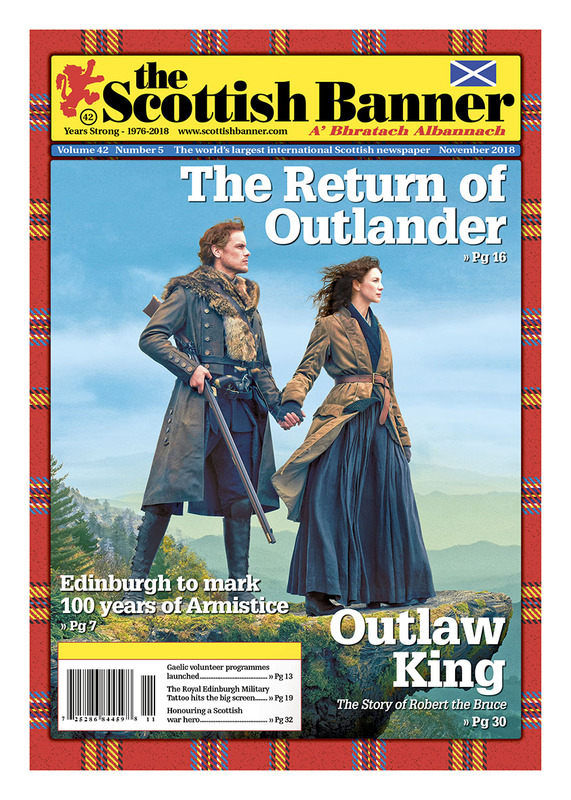 Gracing our front cover: Sam Heughan and Caitriona Balfe return in Season 4 of Outlander. Photo: Starz. Welcome to November which is proving to be a big month for Scotland and Scottish history. This month millions of people across the world will be enthralled with the story of Scotland with two major television releases, Outlander and the Outlaw King. Regular readers of the Scottish Banner will certainly be aware of both productions as we have featured each in past editions. We again have more coverage this month as both shows will no doubt be gaining exposure across the world. Outlander is a phenomenon that has been thirty years in the making as US author Diana Gabaldon penned the first novel, having been inspired by a kilt wearing character in the show Dr Who, never knowing a television show would be created. Her best-selling books are sold in the tens of millions and available across the world. Clearly those of Scottish background have been instantly drawn to the story of Claire and Jamie Fraser as the time-travelling drama is laced with Scottish history which Gabaldon has researched so well. However, this is more than a hit show, as hosting productions such as Outlander not only generates significant income for Scotland, but also boosts the Scottish screen industry by creating an opportunity to train the next generation of directors, producers, craft and technical crew. A team of twenty Scottish-based trainees were selected for an intensive skills development training programme on Season 4 of the award-winning TV production, fifteen of which were taking their first step into the Film and TV industry. Working alongside highly experienced crew members on location and in Wardpark Studios, Cumbernauld the trainees will develop skills in a variety of creative and technical roles. The “Outlander effect” also has also had a positive sweeping impact across Scotland with tourism numbers increasing due to the show. Venues used have included Blackness Castle, doubling as the Fort William headquarters of Black Jack Randall, which has seen visitors rise by 182%. Doune Castle, doubling as Castle Leoch and home to Colum MacKenzie and his clan, saw numbers up an incredible 227%. Outlander tours have now begun across Scotland to cater for those who have a new-found interest in Scotland. Why is this so important? The latest available figures show that spending by tourists in Scotland generates around £12 billion of economic activity for the wider Scottish supply chain and contributes around £6 billion to Scottish GDP, representing about five per cent of total Scottish GDP. The tourism industry in Scotland supports more than 217,000 jobs accounting for around 8.5 per cent of employment in the country. Outlander is also encouraging more people to live and work in the Highlands thanks to a huge boost in interest created by the hit sci-fi series, which has had a positive impact on both the local job market and the housing market. This month Scotland’s biggest budget feature film ever to be produced in Scotland by home-grown talent, will be released globally on subscription service Netflix. Outlaw King, tells story of Robert the Bruce, and is directed by one of Scotland’s foremost filmmakers, David Mackenzie and features a cast principally of Scottish and UK leading actors alongside leading actor Chris Pine. 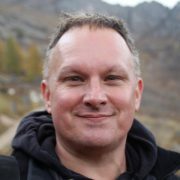 The production which is set and shot entirely in Scotland, has also employed a large number of Scottish based craft and technical talent and utilised over 45 different locations including Craigmillar Castle (Edinburgh), Linlithgow Palace, Berwick Bridge, Talisker (Skye), Glencoe, Doune Castle, Mugdock Country Park (Milngavie), Coral Beach (Skye) and the Quiraing (Skye). Outlaw King has also hosted Scotland’s biggest ever single film trainee initiative. 35 trainees have experienced working across the creative, technical and business areas of the production. Dedicated to nurturing the next generation of filmmakers, the programme reflects the aims of valuable similar initiatives taking place across Scotland working to develop a continuous flow of skilled and creatively ambitious craft and technical crew. Both productions pull in some great star power, however arguably one of the biggest stars of the series and the biggest scene-stealer, is Scotland itself, with its stunning landscapes and historic buildings, towns and villages and of course it’s incredible and brutal history used as a story line. Alongside our Outlander and Outlaw King coverage we also must never forget 100 years ago this month. November 11th is the 100th anniversary of the signing of the Armistice, which will recognise the significance of the end of the First World War, and the sacrifice made by so many men and women during the war. Scottish soldiers sat alongside those from many nations and today are still not forgotten. An example of remembering them is being shown by the small town of Wigtown, who are honouring hometown Victoria Cross recipient Sergeant Louis McGuffie. For some it’s a regular pilgrimage and for other it sits at the top of their very own bucket list. The Royal Edinburgh Military Tattoo is a show like no other. Steeped in tradition and musical excellence we hear from Tattoo on this year’s spectacular “The Sky’s the Limit”. Like the shows mentioned previously the Tattoo is also nurturing the next generation, with pipers and drummers from around the world invited to take part in The Pipers Trail. St Andrews Day is on November 30th and celebrations will take place across the globe. As always you can find some listed on our events page and we wish all our readers a very Happy St Andrew’s Day! So, as you sink into your favourite chair or perhaps binge-watch some of the great Scottish themed and made drama that is hitting our screens this month, consider just what a positive impact it will have for Scotland. More people will fall in love with Scottish history, as well as the film locations and want to visit. Also the great benefits to a variety of industries in Scotland, which will help the Scottish economy today and into the future. With the release of the upcoming blockbuster Mary Queen of Scots to next enthral audiences in the cinema, Scots are certainly lucky our story is so great that it continues to be told to a wider audience, who no doubt will join us in falling under the spell of Scotland.